4 Gallon Back Pack. This is our 4 Gallon Back Pack model. Built to our specifications, this sprayer features all heavy duty components. It has a pressure gauge attached to the valve, a check flow filter at the nozzle, an adjustable brass nozzle standard and extra strong tank. It has a locking valve and pump handle which is both comfortable to use and easy to pump. The shoulder straps are easy to adjust and comfortable compared to similar designs featured on other models. The best way to use these straps is to pull them loose, place the sprayer on your back and then pull them tight from the front. They feature a one way adjustment which acts like a cinch. You are able to pull it tight quite easily allowing for a tight comfortable fit. This sprayer can be used inside but it is really designed for outside applications where 2-4 gallons will be applied. It has a four gallon tank but you only need to mix up what you intend on using. All parts are interchangeable with the 2.5 gallon pullalong and our 1 gallon pump sprayer. It has several options which can enhance performance and either the 18 inch or the 23-40 inch wand extensions should be used if you are getting this sprayer for treating up high. This sprayer can be pumped up to over 80 PSI thus enableing it to reach heights of over 30 feet. Having this power enables this sprayer to be good for spray jobs that must reach high places. But it’s equally functional when you need one to focus in on the ground. 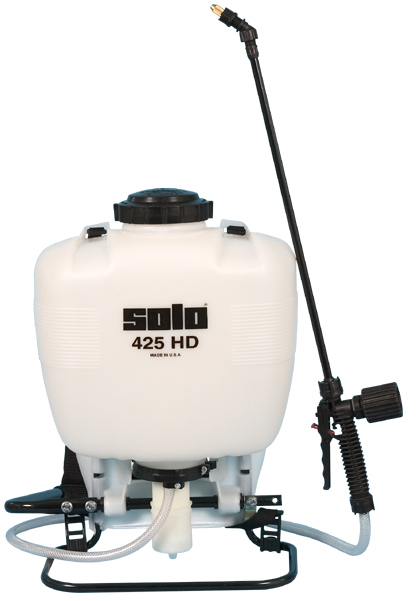 There is an optional 48″ Spray Boom add-on enabling this sprayer to make a consistent and uniform spray pattern perfectly suited for herbicide and/or liquid fertilizer applications. This video shows how to use the Back Pack to spray up high. This next video shows how to use a Pin Stream Spray to better accuracy. This shows the Back Pack spraying with a Fan Pattern Nozzle. This last video shows how to use the Adjustable Cone Jet Nozzle with the Back Pack.